Templates make it faster than ever to send digital gift cards and prepaid cards to your contacts. 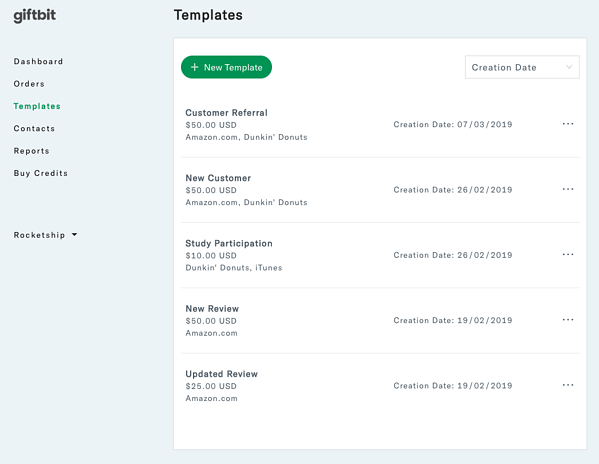 Templates streamline offer creation by making content and settings reusable across multiple orders. Templates store the message content and settings needed to create offers. Some sections have default settings, such as the sender name, but you can replace these with custom values as you like. There is also now a Preview button on templates for you to view how your offer appears to contacts. You can toggle between desktop and mobile versions of the offer. Once all of the sections are complete, your template is ready to use. 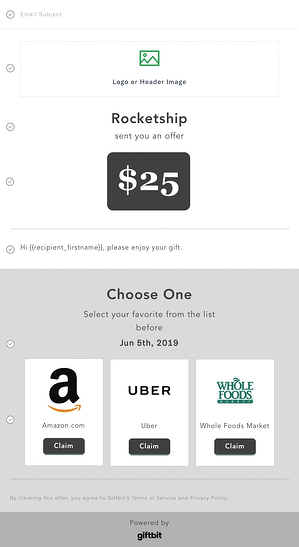 To send gift cards to your contacts, click on Orders, then choose one of your completed templates. All orders now require a template. If you don't have a template ready, you can create one by clicking on "Start from Scratch". Add your list of contacts and confirm to finish placing your order. Pulling details from a template helps guard against mistakes in the ordering process. Each order placed with the same template will have consistent settings and content. Knowing the format is perfect takes the stress out of confirming your order. Bulk sending is remarkably quick--choose a template, add your contacts and place your order. 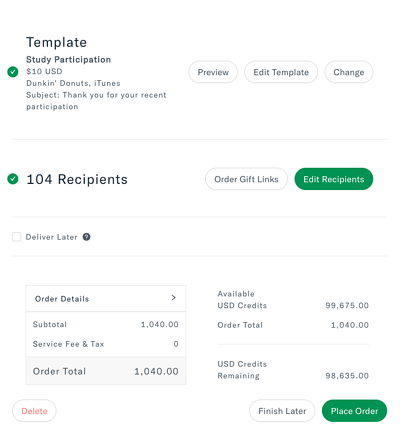 Exit at any point while creating a new template or while placing an order and your progress will be saved as a draft automatically. You can come back at a later point in time and continue where you left off. Draft templates are particularly useful if message content requires sign-off from your marketing or legal department. You can even label your templates, so you know which ones are waiting on approval and which ones are ready to use. The freedom to save multiple templates helps you stay organized when you have more than one initiative in progress. You can create templates for each of your projects, or even different payout amounts for the same project. Templates can be used to A/B test different variations of your rewards to determine whether you're choosing the right value and format for your audience. Try creating two versions of your template with different messages, brand options, or values. Send each version to half of your contact list. Once both campaigns conclude, run the user report to see which format was redeemed most. A difference of $5-10 could change the performance of your offers in a significant way. Click on What's New in your Giftbit account and try out the new template features today!